Painter Daniel Nevins remembers the exact day he “opened the door to a new muse.” It was April 6, 2009, and after decades of building a reputation for his serene figures in dreamlike settings, he abandoned narrative painting, and struck out for new territory. Instead of depicting the stories that we as humans tell ourselves, he says, he went deeper, into the energy that’s in us and all around us. Part spiritual, part biological, his new work portrays unrestrained forms that aren’t really forms at all, but “an animating force” as he calls it. They’re not so much paintings as a Rorschach test for those who view them. “What you see there is what you bring to it,” Nevins says. The shift was as an undeniable impulse, a leap-and-the-net-will-appear proposition, the artist explains. With dozens of gallery shows behind him and a market that supported his established work, change was risky. While some collectors were excited, not everyone made the leap with him. But as some doors closed, others opened. In 2012, he was one of only 18 artists awarded a North Carolina Arts Council Fellowship, a grant that provides artists with financial support for pursuing new work. More important than the recognition though, is the satisfaction Nevins receives from the fresh direction. “I feel better about painting now than I have in 10 years,” he says. A native of Florida, Nevins never took a painting class, and came to the medium via graphic design. In those pre-computer days, he says, the work was much more physical—X-acto blades and layout boards were the tools of the trade—so the jump to painting wasn’t much of a stretch. His early commercial designs caught the attention of Warner Bros Records, and he designed more than 30 CD covers, leading him in a more creative and less commercial direction. 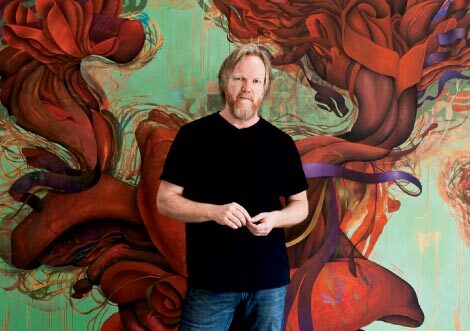 When design shifted to computers, Nevins became a full-time painter and moved to Asheville in 1998. Ironically, it was just a few months after he had hit upon his new vein of inspiration that he received a commission to create a large body of work in his familiar style. In 2009, children’s book publisher, Candlewick Press, hired him to illustrate With a Mighty Hand: The Story in the Torah, written by Amy Ehrlich. In the book, Nevins interprets the stories of Adam and Eve, Moses and the burning bush, and Joseph and his coat of many colors through a collection of 50 paintings that took two years to complete. The book is scheduled for release August 27. Photographs by: (Portrait) Kathryn Ray; (Artwork; 3) Double Exposure Art (Joseph and his brothers) with A MIGHTY HAND. Text copyright &copy; 2013 by Amy Ehrlich. Illustrations copyright &copy; 2013 by Daniel Nevins. Reproduced by permission of the publisher, Candlewick Press, Somerville, MA.